Druids are members of a secretive brotherhood of individuals who have studied the magical forces of the earth. Druids have the ability to cast divine spells focusing on animals, healing, fire, lightning, the wind and the earth. They have more offensive power than clerics, who concentrate on healing. They adventure to gain knowledge and power. Sometimes, they are assigned a mission by higher-ranking druids. A lower-ranking druid can also seek help from his superiors. 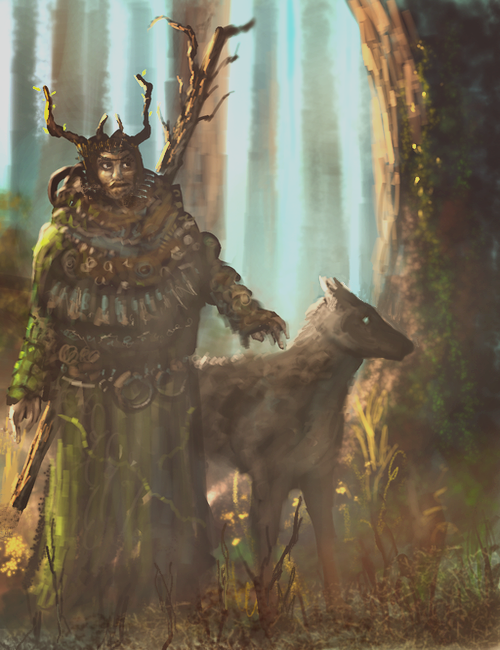 Some druids devote their life to the protection of a remote wilderness area, their sanctuary. The Shamans of primitive societies are often Druids or Clerics. D8 Hit Die. Light and medium armour proficiency, light shield proficiency. Starts with simple-weapons proficiency plus light swords proficiency. The alignment must be true neutral, neutral good, neutral evil, lawful neutral or chaotic neutral. Natural Armour: Druids gain a natural armour enhancement bonus at levels 4, 9, 14 and 19. Elemental Sphere: At level 1, Druids may choose to be attuned to an elemental sphere if they wish. Each sphere provides several spellcasting bonuses. Not having any attunement also provides benefits. When a Druid selects an elemental sphere, a prefix is added to his class name. For example, a Druid attuned to Fire is called a Fire Druid. Fire: Your spells Produce Flame and Flaming Sphere are Empowered for free. The range of your Produce Flame spell is increased from Medium to Long. The radius of your Flaming Sphere spells is increased from 10 feet to 15 feet. The radius of your Flame Strike spells is increased from 10 feet to 15 feet. You cast the spell Fire Storm as a level-6 spell. The damage of your spells Flame Strike, Fire Storm, Sunbeam and Sunburst is increased by one point per level. Your summoned fire elementals gain a +2 bonus to Strength. You gain access to the level-6 spell Summon Efreeti (CR 8). Fire Druids are also called Pyromancers. Earth: Your spell Magic Stone is Empowered for free and the range is increased from Medium to Long. The radius of your Entangle and Spike Growth spells is increased from 15 feet to 20 feet. You cast the spell Barkskin and Mass Barkskin as a move-action spell. The radius of your Quicksand spells is increased from 10 feet to 15 feet. Your spells Turn Pebble to Boulder and Earthquake are Empowered for free. You cast the spell Earthquake as a level-7 spell. Your Wall of Stone spells last 3d6 rounds instead of 2d6 rounds and the maximum length increases from 25 to 35 feet. You cast the spell Stoneskin, Personal as a level-4 spell. Your summoned earth elementals gain a +2 bonus to Strength. You gain access to the level-6 spell Summon Crystal Golem (CR 8). Earth Druids are also called Geomancers. Air: The radius of your spells Call Lightning and Call Lightning Storm is increased from 10 feet to 15 feet. The radius of your Fog Cloud spells is increased from 20 feet to 30 feet and the range is increased from Medium to Long. Your Gust of Wind and Greater Gust of Wind spells are more powerful. The damage dealt increases by 1d6 and you can affect creatures of one size category higher. You cast the spell Wind Wall as a move-action spell. You cast the spell Insect Plague as a level-4 spell. Your spells Sirocco and Whirlwind are Empowered for free, and Whirlwind may stun gargantuan creatures. Your summoned air elementals gain a +2 bonus to Strength. You gain access to the level-6 spell Summon Invisible Stalker (CR 8). Air Druids are also called Aeromancers. Water: All of your Cure and Mass Cure spells are Empowered for free. The radius of your Mass Cure spells is increased from 10 feet to 15 feet. The range of your Mass Cure spells is increased from Medium to Long. Your spells Ice Lance, Ice Storm and Greater Ice Storm are Empowered for free. You cast the spell Ice Lance as a level-3 spell. You cast the spell Heal as a level-6 spell. You cast Regeneration and Mass Regeneration with a move action, rather than a standard action. Your summoned water elementals gain a +2 bonus to Strength. You gain access to the level-6 spell Summon Giant Crab (CR 8). Water Druids are also called Aquamancers. Cosmos: This is the default sphere for all non-attuned Druids. You gain one extra spell slot of spell level 1, 2, 3, 4, 5 and 6. Spells: The leading ability for Druid spells is Wisdom. A Druid can activate Divine Spell Scrolls of any spell in the lists of the Paladin, Ranger, Druid and Cleric. Druids cannot cast spells while wearing metal armour. They can wear Leather Armour or Hide Armour. Spell picks at level 1: 3 + Wisdom modifier. Spell picks at all other levels: 2. A Druid can cast somatic spells while holding a light shield, but not a heavy shield or tower shield. Druids can also cast somatic spells while wielding a two-handed weapon or several weapons at the same time, because switching a weapon from one hand to the other is a free action. A character cannot have more than one summoned creature at a time. Single Effect: Choose a single creature, then choose an ongoing magical or psionic effect on that creature. It is dispelled if you succeed on a check of 1d20 + level (up to 10) + Spell Focus bonus versus DC of 11 + level of the mage who created the effect. If the effect is 'summoned', the creature is unsummoned. Effects on Creature: Choose a single creature. You make a check for each ongoing effect on the creature (but not effects from items). A successful check dispels that effect. Greater Dispel Magic Same as Dispel Magic, but your dispel checks are equal to 1d20 + level + Spell Focus bonus. Spell Focus: The DC of all spells with a saving throw increases by 1. Greater Spell Focus: The DC of all spells with a saving throw increases by another 1. Requires: Spell Focus. Improved Druid Armour: The natural armour enhancement bonus increases by 1. Requires: Level 6. Greater Druid Armour: The natural armour enhancement bonus increases by another 1. Requires: Level 15, Improved Druid Armour. Nature's Vigour: The base constitution increases by two permanently. Requires: Druid level 9. Environmental Aptitude: The druid can cast the spells Freedom of Movement, Personal, Freedom of Movement, Touch, Mass Freedom of Movement and Water Breathing using a move action rather than a standard action. Additionally, the gold cost of casting Freedom of Movement, Personal is removed. Furious Lightning Storm: You deal 1d6 points of extra damage with the spells Call Lightning and Call Lightning Storm and 1d6+1 points of extra damage with the spell Chain Lightning. Fire Mastery: You deal 1d6 points of extra damage with the spells Produce Flame, Flaming Sphere, Flame Strike and Fire Storm. Wind Mastery: Your spells Gust of Wind and Greater Gust of Wind gain a +2 bonus on their Difficulty Class and the damage they deal increases by 1d6 points. In addition, allied creatures in the area of effect are no longer affected. Water Affinity: When fighting underwater or while swimming, the character gains a +2 circumstance bonus to Attack Rolls and Armour Class. Forest Affinity: When fighting in a forest or jungle, the character gains a +2 circumstance bonus to Attack Rolls and Armour Class. Fire Resistance: The character gains resistance 10 to fire damage. Cold Resistance: The character gains resistance 10 to cold damage.